New York, New York (December 17, 2014)—The Beyond the Boroughs National Scholarship Fund, (http://www.beyondtheboroughs.org/), a charity organization focused on providing college scholarships to deserving students who have unmet financial needs, announced their partnership with worldwide tennis megastar Serena Williams and her charitable organization The Serena Williams Fund, (http://serenawilliams.com/foundation/). Serena, ranked six times as the number one women’s singles player worldwide, has selected Beyond the Boroughs to administer her college scholarship program. The Serena Williams Fund was established with two goals in mind; to provide assistance to youth whose families have been affected by violent crimes, as well as to assist college-bound youth from low income backgrounds in receiving the highest quality education possible. Beyond the Boroughs, being the perfect partner for the organization in terms of educational assistance, will work with Williams’ organization to manage the application process, vetting and selecting the best of their applicant pool, and then provide the outstanding applicants to The Serena Williams Fund for final awardee selection. All Serena Williams Scholars will also be eligible for internships and service learning trips through Beyond the Boroughs. Students can apply online at www.beyondtheboroughs.org free of charge between January 15, 2015 and March 15, 2015. “I know the value of creating strong partnerships with organizations that are experts in their field. I am so proud of the scholars I have been able to assist in the past and look forward to making this process even more efficient and sustainable by partnering with Beyond the Boroughs”. 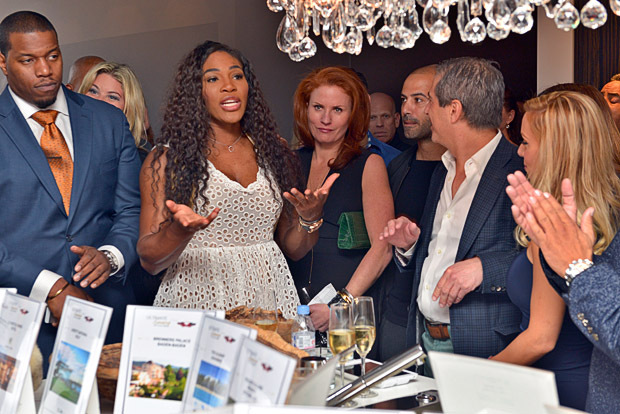 The reigning number one women’s tennis player excitedly announced this partnership at the home of Marc Leder, Co-Chief Executive Officer of Sun Capital Partners, on Friday night, standing side by side with Beyond the Boroughs Founder, Tutan Reyes. Beyond the Boroughs was created in 2007 by NFL Veteran Tutan Reyes and offers general scholarships for up to $5,000 per year as well as named scholarships under personal, family or business titles that can help pay for a student’s semester starting as low as a $2,500 donation. In 2013 alone, Beyond the Boroughs selected 11 students to receive $24,500 in funds to assist them in the pursuance of their college careers. Scholarship winners were from all over the country and in many cases, represented first generation college students in their families. For more information on The Serena Williams Fund partnership with Beyond the Boroughs partnership, or to submit a scholarship application please visit http://www.beyondtheboroughs.org/ . For all media inquiries e-mail info@beautifulplanning.com or call 1.877.841.7244.